The Vikings took that as a challenge unlike anything they’ve faced all year and, in the end, have got themselves their first state championship berth since 1994 with a 28-14 win over a defensive-minded Falcons team at Pop Keeney Stadium in Bothell, fueled by two rushing touchdowns and a clutch touchdown pass by senior quarterback Tre Long. After a scoreless first quarter, the Vikings got on the board on a 1-yard touchdown (TD) run by Long to make it 7-0, but before the half was over, the Falcons made it a whole new ballgame, tying it up at 7. On the first drive of the second half, the Vikings took the lead once again on another touchdown run by Long, but after a missed extra point by senior kicker Brock Widmann, they only led 13-7, putting the Woodinville Falcons in position to take the lead from the Vikings for the first time tonight, and they did just that, taking a 14-13 lead after a Falcon touchdown pass, but after each team punted the ball after each teams’ stellar defense kept them at bay, things got interesting when Lake Stevens got the ball back. 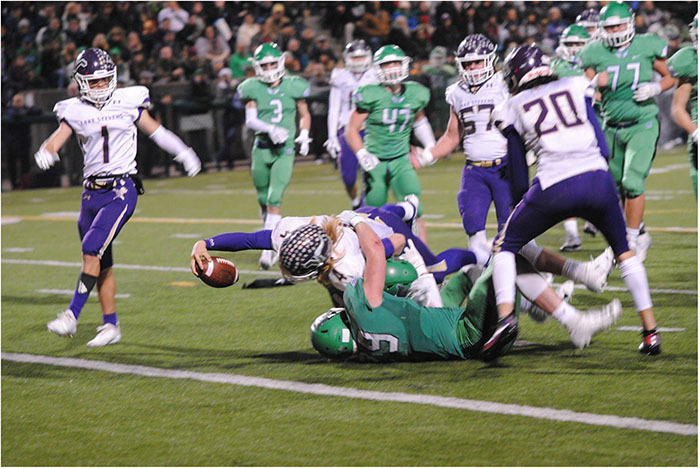 As the third quarter was coming to an end, the Vikings were driving into Woodinville territory, but, after a couple holding penalties, had to run a play from 3rd and goal on the Falcons’ 45 yard line. That play ended with a 45-yard TD pass from Long to senior wide receiver Ian Hanson to re-take the lead 20-14 early in the fourth quarter. After another Woodinville punt, the Vikings we’re not only driving again to make it a two-possession game, but to also run the clock out as much as they can, But they had to switch gears with 5 minutes left in the game after Long fumbles the ball at the Falcons’ 4 yard line, giving them new life, down by 6, but they would be shut down after an interception by senior defensive back Joe Gonzales gives the Vikings another chance. Lake Stevens would not relinquish the ball this time, as junior running back Dallas Landeros would get in on the action with a 9-yard touchdown run to put the game out of reach at 28-14, but the celebration wouldn’t start until Gonzales picks off another Woodinville pass to seal the game away for good. Long finished the game completing 12 of 21 passes for 120 yards, a touchdown and an interception, while also carrying the ball 14 times for 59 yards and two scores. Landeros also paved his way on the ground, carrying the ball 18 times for 111 yards and a touchdown. For the final game of the 2018 high school football season, your Lake Stevens Vikings will play the Union Titans from Vancouver, Washington in a battle of unbeatens in the Washington Interscholastic Activities Association (WIAA) 4A state championship game at the Tacoma Dome on December 1st at 7:30pm. They are playing in the title game for the first time since 1994, when they lost to the O’Dea Fighting Irish 7-6 in the 3A state championship game at the Kingdome.